Anyway on the left is one of the skeletons from the Caesar Miniatures Undead package. 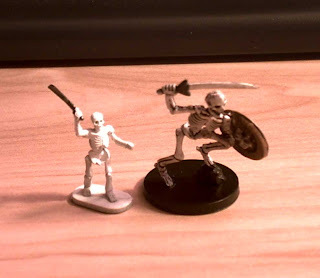 On the right is the skeleton from the D&D Basic Game (3.5 edition) from Wizards of the Coast. Now, this guy is crouching down (an artifact of the plastic they use, I think, or else he's just that way because he was smushed) or else you'd see that the Caesar fellow is about 2/3 the height. In another, unphotographed, comparison, he's a bit taller than a Halfling Brawler, if you're familiar with that figure. Now, the WOTC figs are somewhat taller than the old 25mm "standard". This scale creep is sometimes called 28mm, Heroic 25mm, or even 30mm. My figures may be much smaller, but at least I can carry more of them for less weight and in a smaller box, to boot. I didn't get around to doing any dipping last night. Tonight, I hope -- the stuff requires adequate ventilation, so I generally do it outdoors. We'll see. Have you found any other sources for 1/72 scale fantasy minis in plastic? At these prices, I think there'd be a big demand for such things. No, actually, no other fantasy; the 1/72 plastic field seems to be Caesar and a bunch of guys re-issuing old Airfix sets. And really, most of Caesar's sets are historical. That's a simplification, of course, but there's not a lot of fantasy stuff out there. I am thinking of getting some 28mm orcs, to use as Ogres; that should be about the right scale. And of course, there are an awful lot of humans out there from history that can be used as various nationalities in a fantasy game. hmmm... looking at the pic and from a little research, it seems that 1/72 scale is around 20mm. Perhaps there is a figure maker that makes fantasy in 20mm? Or there may be some largish 15mm figures that would fit in or smallish 25mm's. I used to think that 1/72 was 20mm, but I got stomped on pretty hard by someone who actually measures such things. I was going to measure my zombies from the game Zombies!! !